Over two months after its historic flyby of Pluto, New Horizons is sending back a stream of data, helping its science teams answer outstanding questions about the dwarf planetary system and explore new mysteries surrounding Pluto’s formation and its relationship with the Kuiper Belt and the solar system. It was a moment that hundreds of thousands of people around the world took part in: New Horizons’ closest approach to Pluto and humanity’s first visit to the dwarf planet at the inner reaches of the Kuiper Belt. 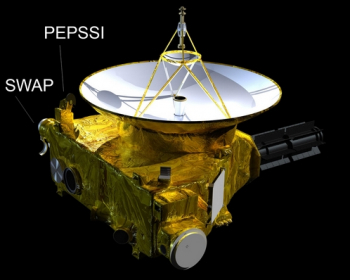 But while people around the world celebrated, New Horizons’ engineers and controllers were anxiously hoping that the flyby was actually happening as planned, as it would be another painstaking 13 hours before they would learn if the intrepid little probe had survived flyby and collected all the information it was tasked with gathering. Based on the needs of the mission and design criteria for New Horizons, the probe was not in contact with Earth during any part of the flyby encounter – instead focusing all its abilities on collecting the wealth of scientific data it was instructed to. If all went to plan, New Horizons would only contact Earth once it swung past Pluto, completed its scientific collection phase, and was outbound from the dwarf planet. While close flyby occurred at 07:49:55 EDT in the U.S., with New Horizons passing just 12,500km (7,800 mi) from Pluto, New Horizons would not exit flyby mode and send its “I’m alive” signal until 16:22 EDT. It would then take that “I’m alive” signal 4.5 hours to reach Earth. 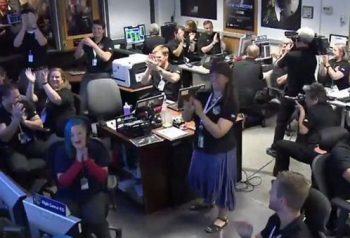 At 20:52:37 EDT, after a stressful final minutes of waiting, the “I’m alive” signal reached Earth to the jubilation and cheers of New Horizons’ engineers and scientists – and also to the elation of the two children of Clyde Tombaugh (the person who discovered Pluto in 1930). Within NASA, John Grunsfeld, Associate Administrator for NASA’s Science Mission Directorate, stated that “With the successful flyby of Pluto, we are celebrating the capstone event in a golden age of planetary exploration. For the New Horizons control team and scientists, the “I’m alive” signal only confirmed that the probe was alive and healthy following flyby. Within minutes, New Horizons’ MOM (Mission Operations Manager) confirmed the most important part: New Horizons had executed all flyby commands and had gathered all the data and conducted all the scientific observations it was supposed to and was now ready to start sending all the data back to Earth. For the control team and the scientists, the next phase of the mission began: the 16 month process of getting all the collected data downlinked from New Horizons to Earth. 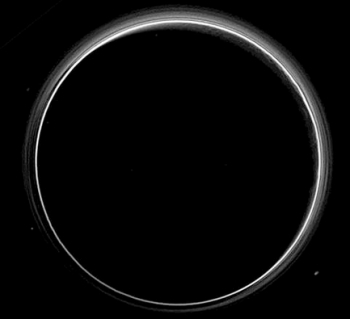 Within just the first three weeks of the 16 month data download from New Horizons, mission scientists had already unlocked many of Pluto’s fuzzy mysteries with startlingly clear images and radiography and spectrometry results revealing a young, still-forming surface and an atmosphere much more – and at the same time much less – than expected. Since then, data has continued to come back from New Horizons, with the onslaught of data downlink – known as the intensive data downlink phase – beginning on 5 September. According to Alan Stern, New Horizons Principal Investigator, “This is what we came for – these images, spectra and other data types that are going to help us understand the origin and the evolution of the Pluto system for the first time. 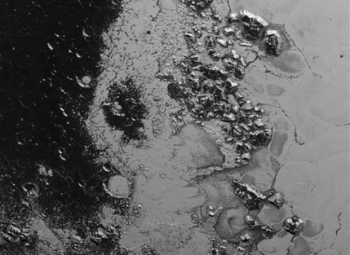 Within 24 hours of the flyby, New Horizons sent back a startlingly clear and detailed image of a mountainous region on Pluto located on the edge of Tombaugh Regio (the heart-shaped surface feature). Located near the equatorial region of Pluto, the icy mountain range, with peaks as high as 3,500 m (11,000 ft), likely formed no more than 100 million years ago – relatively young compared to the 4.56 billion year age of the solar system. “This is one of the youngest surfaces we’ve ever seen in the solar system,” said Jeff Moore of the New Horizons Geology, Geophysics and Imaging Team. The relatively young mountains and surrounding section of Pluto’s surface offered the first and surprising indications that Pluto could still be geologically active today – much like Earth continues to be geologically active. Furthermore, this discovery could have widespread implications for how scientists think about geological activity and what powers it. Unlike the giant planets’ icy moons (e.g. Enceladus) which are still geologically active because of tidal heating created during those icy moons’ orbits of their much larger parents, Pluto’s current or recent geological activity cannot be explained by tidal heating from a larger body (in the way Enceladus’ can) because there is no larger body near Pluto. Thus, given Pluto’s icy composition, there must be a different mechanism occurring on/within Pluto to permit this continued geologic activity – a mechanism that if understood could help scientists better discern the formation processes of the outer icy worlds. 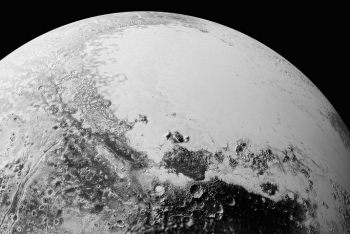 Moreover, within days, new images from New Horizons revealed further stretches of geologically young (no older than 100 million years) frozen plain features on the center-east region of Tombaugh Regio. The frozen plains of irregularly-shaped segments 20 km (12 miles) across and bordered by shallow troughs bear striking resemblance to frozen mud cracks on Earth. 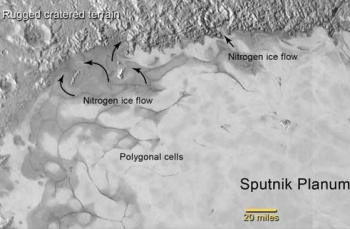 In the initial review of the frozen plains, scientists developed two working theories as to how they formed. The first theory revolves around the idea that the frozen plains are a result of the contraction of surface materials, similar to what happens when mud dries on Earth. The second working theory is that the frozen plains are a product of convection, similar to wax rising in a lava lamp. 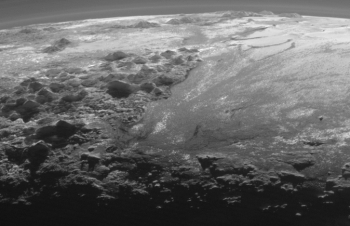 In this manner, convection on Pluto would occur within a surface layer of frozen carbon monoxide, methane, and nitrogen, driven by the minimal warmth of Pluto’s interior. Several days later, new photos revealed that portions of this ice field might still be geologically moving – in much the same way that glaciers move on Earth. The area of the ice field is composed primarily of nitrogen, carbon monoxide, and methane ices. Furthermore, the images caused John Spencer, mission co-investigator, to state that “We’ve only seen surfaces like this on active worlds like Earth and Mars” – thus adding to the mounting evidence that Pluto is still a geologically active world. Following commencement of the intensive data downlink phase, shock regarding Pluto’s wide-ranging and diverse surface features continued to grow. Of particular note to the science teams in the recent images returned from New Horizons is a field of what appears to be dark, wind-blown dunes. “Seeing dunes on Pluto – if that is what they are – would be completely wild, because Pluto’s atmosphere today is so thin,” said Bill McKinnon. Pluto’s surface is not the only part of the dwarf planet that has so far offered up some interesting surprises for New Horizons’ teams. On the second day of data download from New Horizons, images revealed that Pluto’s atmosphere extends as far as 1,600 km (1,000 miles) above the surface of the dwarf planet. Pluto’s atmosphere had previously only been observed at altitudes no higher than 270 km (170 miles) – and as Pluto is currently moving away from the sun in its orbital path, its atmosphere is thought to be in the process of freezing to its surface. The initial information on Pluto’s atmosphere came from the Alice instrument that used spectrography during a carefully designed alignment of the Sun, Pluto, and New Horizons an hour after the craft’s closest approach to the dwarf planet. 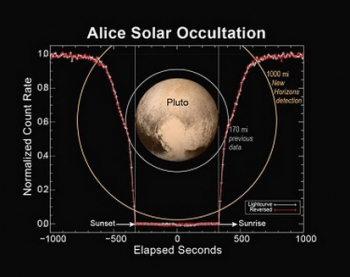 Using a created solar occultation (when a body passes directly between an observation point and the Sun and completely blocks the view of the Sun from the observation point), New Horizons’ Alice spectrograph viewed Pluto’s atmosphere as it was backlit by the Sun. The initial Alice information further revealed that Pluto’s atmosphere matches neither of the two plausible models developed prior to the flyby. Thus far, Alice information has revealed that Pluto’s atmosphere is closer to the “stagnant” model (a large abundance of hydrocarbons) than to the “turbulent” model (low amount of sun-light absorbing hydrocarbons). 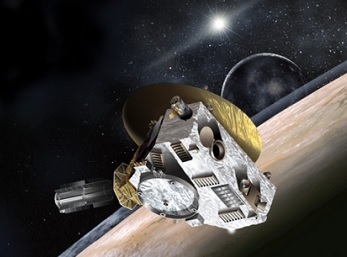 The complete Alice spectrograph was sent from New Horizons in August and will allow scientists to make a more conclusive study of and determination about Pluto’s atmosphere. Meanwhile, as New Horizons passed behind Pluto and began its outbound journey from the dwarf planet, the probe detected an area of cold, dense, ionized gas tens of thousands of miles beyond Pluto. Detected by the SWAP (Solar Wind Around Pluto) instrument, New Horizons captured part of the extent of the loss of Pluto’s atmosphere to the solar wind – one of the mission’s primary objectives. Initial data points showed a trail of ionized escaped nitrogen extending 77,000 km (48,000 miles) to 109,000 km (68,000 miles) “downstream” of Pluto. While this ionized trail confirms that Pluto is losing atmosphere to the solar wind, the specific rate of loss has not yet been determined. But Pluto’s complex atmosphere thus far sampled and returned by New Horizons extends beyond hydrocarbons and how much of the atmosphere is escaping to space. The surface pressure created by Pluto’s atmosphere has also given scientists a shock: It’s far lower than compared to previous observations. Obtained by the Rex radio instrument, Pluto’s surface atmospheric pressure is approximately 1/100-thousandth of the pressure at Earth sea-level. While a lower surface pressure than that of Earth is not surprising given Pluto’s smaller size and smaller atmosphere, this measurement is only about half the calculated surface pressure from just a few years ago. “For the first time, we have ground truth, measuring the surface pressure at Pluto, giving us an invaluable perspective on conditions at the surface of the planet,” said New Horizons researcher Ivan Linscott. 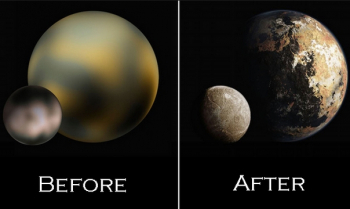 That long anticipated change is the freezing of Pluto’s atmosphere to the surface of the dwarf planet as it moves farther from the Sun in its prolonged orbit. Since this change occurs relatively quickly during Pluto’s orbit, the almost half of expected measurement of Pluto’s surface pressure could indicate that about half of Pluto’s atmosphere has already frozen to its surface since the last measurements were derived in the early 2010s. 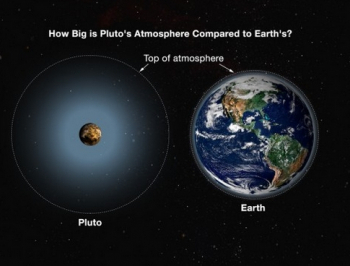 Furthermore, in September, scientists learned even more about Pluto’s multi-layered atmosphere. 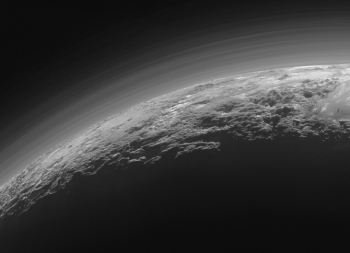 New downlinked images from New Horizons have revealed that Pluto’s global atmospheric haze has many more layers than scientists realized. Moreover, these layers create a twilight effect that softly illuminates nightside terrain near sunset. 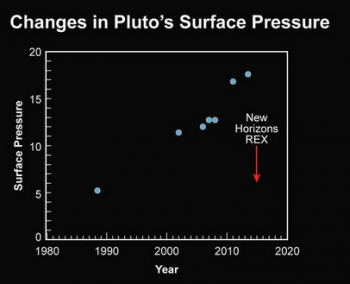 While many people continue to protest the International Astronomical Union’s (IAU’s) official classification of Pluto as a dwarf planet, data from New Horizons – as much as some would hope – is unlikely to change Pluto’s status. 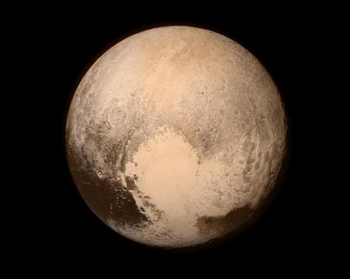 While people have even gone to the length of starting a petition to demand the reclassification of Pluto back to planet status because of the New Horizons flyby, no data returned by New Horizons could change the fact that Pluto has not cleared its neighboring region of planetesimals, the third of three mandatory qualifications for planethood under the current IAU definition. 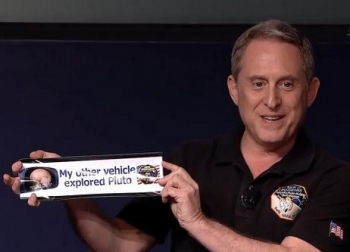 However, one thing that New Horizons did finally confirm with finality is Pluto’s size. With a diameter of 2,372 km (1,474 mi), Pluto is the largest of the five dwarf planets and the ninth largest object known to be in direct orbit of the Sun. Furthermore, by volume, Pluto is the largest known trans-Neptunian object; however, by mass, it is the second most-massive dwarf planet after Eris (also in the Kuiper Belt). The confirmation of Pluto’s size and volume has led some to confer the affectionate title of King of the Dwarfs to Pluto. However, and most importantly, Pluto’s classification neither changes the nature of the information that New Horizons will return nor does it change Pluto’s importance within the larger picture of the solar system. Understanding Pluto and its complex geology and atmosphere will help scientists gain a clearer understanding of how terrestrial bodies within the Kuiper Belt formed/are forming as well as the clues they might hold as to the formation of the solar system (both in general and in terms of how the four terrestrial planets formed billions of years ago).